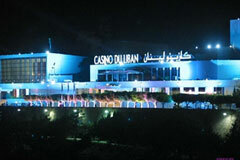 Casino du Liban is a casino located in Maameltein, Jounieh in Lebanon and is 22 km north of Beirut. 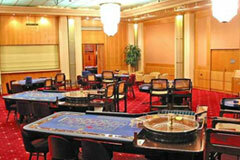 With an area of about 35,000 square meters, the casino has around 400 slot machines and 60 gaming tables. It has a showroom, night club, theater, banquet facility and five restaurants. Located on the ground floor of the Casino, this gaming room provides a cheerful and relaxed atmosphere for high and low rollers alike. 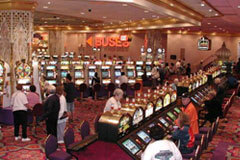 More than 500 top-of-the-line slot machines are available in a vibrant gaming district of the casino. Enjoy the many slot reels, horse races and video games before you and get enticed by the strange magnetism of bright flickering lights and jiggling tokens, a real temptation not worth resisting. Slots Reels, Roulette, Horse Race, Poker and other Video Games. 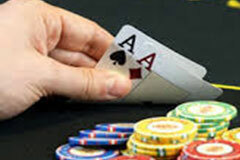 June 2007, Casino du Liban successfully launched the ever awaited Texas Holdem tournaments, which have become a highly recognized event attracting high end players from different neighboring countries. Currently, regular tournaments (freeze out, re-buys & add-ons type) are being held on a weekly basis with entry fees ranging from $100 to $5,000. Additionally, Casino du Liban holds relatively small entry-fee satellite tournaments providing poker players with the opportunity to win seats in high buy-in levels events. The Theater du Liban is a veritable temple of art & culture with its fulsome burgundy decor, a 1000 plus seating capacity set to accommodate the creme of the crop and a spacious stage equipped with state-of-the-art audiovisual technology. The Theater has hosted a wide variety of breathtaking performances including local plays, international ballets, operas, Broadway productions, French comedies, jazz concerts and many others. With an unrivalled prestige, the Salle des Ambassadeurs is an internationally renowned venue that has shaped the reputation of Casino du Liban due to its legendary pre-war performances which immersed the audience in a marvelous world of fantasy and delight. Lavish and elegant, the incomparable venue is one to admire and remember. With a 600 plus seating capacity, a blend of traditional service and a modern-day sophistication, the Salle des Ambassadeurs is the epitome of a new art of living, featuring a series of remarkable performances that have mesmerized the public with grandeur and extravagance.